After AzhwAr said “kANga nam kaN” in the previous pAsuram, emperumAn shows his beauty to AzhwAr and he enjoys that beauty. kaNNum kamalam – As mentioned in jithanthE sthOthram 1 “jitham thE puNdarIkAksha” (Oh emperumAn with lotus flower-like eyes! We have been won over by you), his eyes will win us over and we will have to say the aforementioned line with trembling body. His divine eyes will first establish contact with us due to his grace. kamalamE kaiththalamum – next, the hands will touch us. 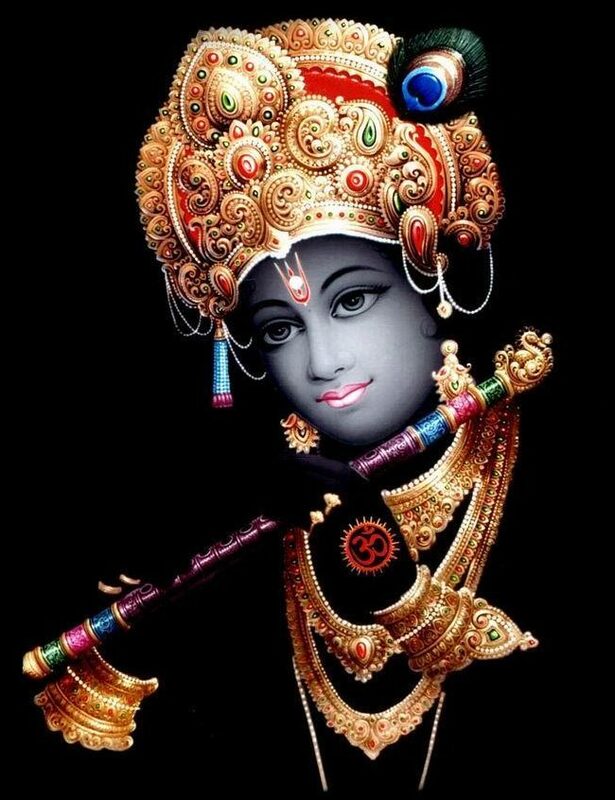 When we lose out to the divine eyes and fall at his divine feet, wouldn’t the divine hands lift us and embrace us! maN aLandha pAdamum maRRavaiyE – the divine feet are the ones that we fall on to, after losing to the beauty of his divine eyes and after being touched by his divine hands. maN aLandha pAdhamum maRRaviayE – the lotus-like divine feet were the ones which measured the world which is full of forests and streams [referring to the ups and downs on the surface which would have hurt emperumAn’s soft divine feet]. eNNil – AzhwAr says that we cannot delve into this. His beauty will be such that it will not allow us to delve into it. It will bewilder us. Even if we take efforts to delve…. karumA mugil vaNNan – emperumAn has the form of great, dark coloured cloud. kArkkadal nIr vaNNan – he has the complexion of the waters of dark coloured ocean. thirumA maNivaNNan – he has he colour of a highly radiant, very expensive gemstone. It is a very great gemstone (belonging only to him). Since there is nothing which can be considered as matching his characteristics, AzhwAr is picking up a few things here and there to explain his characteristics, similar to picking grains. In other places, the simile will be higher than the object which was meant to be explained in the first place. But in the case of emperumAn, the similes will always be insignificant compared to him. karumA mugil vaNNan – this refers to the ability of his form to remove the fatigue of those who have the fortune to see him. kArkkadal nIr vaNNan – this refers to the ocean which cannot be estimated by the eyes. thirumA maNivaNNan – refers to being totally cool and comforting. thEsu – total beauty. Refers to samudhAya SObhai – beauty taken for the entire divine form instead of speaking about individual divine parts. We shall move on to the 10th pAsuram next. This entry was posted in iyaRpA, mUnRAm thiruvandhAdhi on March 4, 2018 by T N Krishnan.